Prime Minister Abe Shinzo has arrived in Trinidad and Tobago (Link - J) for a two day visit (Link), a part of his 11 day summer smash tour of five Latin American and Caribbean countries (Link). Tomorrow, he will be meeting with 14 heads of state attending the CARICOM conference, adding a big chunk to his already impressive list of meetings with heads of states. He then heads on to stops in Colombia, Chile and Brazil. 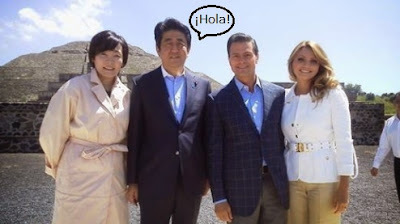 While the first visit of a prime minister of Japan to Latin America in a decade -- yes, the last Japanese premier to survive in office long enough to make such a trip was Koizumi Jun'ichiro -- should be significant in its own right, the leisurely (for Abe Shinzo) jaunt is being treated as an echo of Xi Jinping's July 15-22 visit to the region. (Link). Not an impressive comparison. Just in terms of striking business deals, a customer is usually far more welcome than a salesman. Original image courtesy: Abe Shinzo official Facebook page. Can sporting mega-events bring change to Japan? Guest blog: review of "ASEAN product safety law"
How different are the newly enfranchised Japanese voters? Yen for Living is moving! Review: Just Only Love/What Is Love?